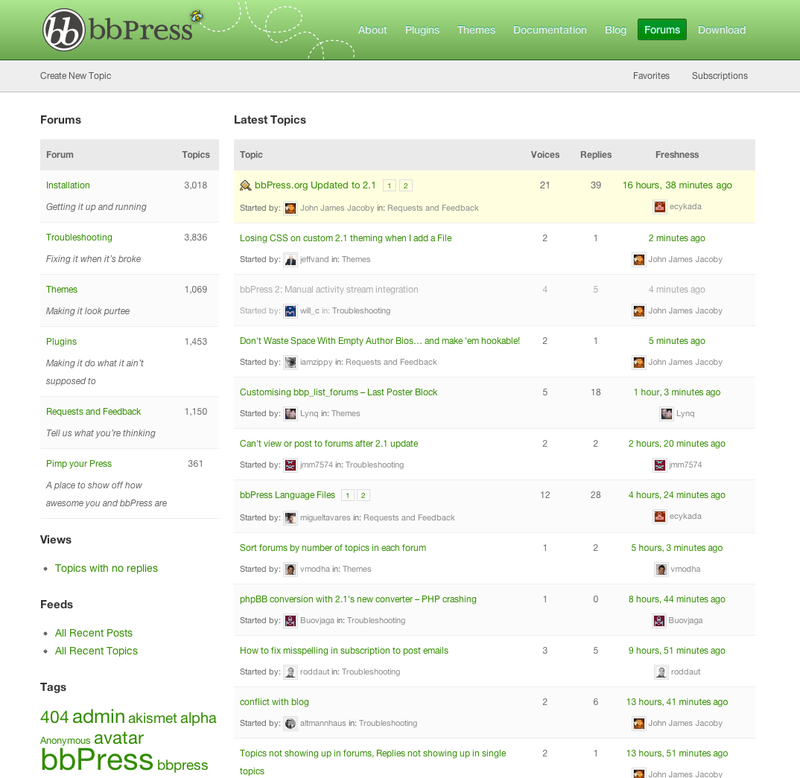 It was July 13, 2010 that the rebirth of bbPress began, and on September 21, 2011 it was re-released entirely as a plugin for WordPress. By using custom post-types, taxonomies, and the rest of the existing WordPress codebase, bbPress immediately became the easiest forum software to integrate with your existing WordPress powered site. Since then, moving bbPress.org to use the new software has been a constantly pending (and urgent) task. I set aside the entire weekend to make it happen, and what you’re looking at now (and immortalized in the screen shot below) is the result. My main goal was to maintain the old look and feel as closely as possible, to keep things familiar and show off how a little smoke-and-mirrors help duplicate the bbPress 1.1 style. The only exception is when viewing a single topic, the main post is separated out from the replies to give it the importance it deserves. I also wanted to open it up and let it breathe, so there’s a bit more white-space between the elements. Lastly, I switched the typeface to a ‘Helvetica, Arial, Sans-serif’ stack, and bumped up the size through-out, hopefully making it a little easier to scan and read. Props to Ben Dunkle for the bbPress icon set, and Chelsea Otakan for a little design inspiration. Thanks for your work on the new look. It looks awesome. JJJ, thank you for all the hardwork in put into this site as well as the plugin. Looks great! When will forum registrations be opened back up? Soon. In the meantime, anyone can use WordPress.org’s sign-up process. Lastly, I switched the typeface…and bumped up the size through-out, hopefully making it a little easier to scan and read. Thank you ! You the best ! Looks great! Will this template be made available for public use? I’m more interested in the layout of the homepage, which is more similar to the 1.x branch. I need to do some clean-up before that happens. I’ll be working on open-sourcing as much of the bbPress.org and BuddyPress.org sites as I can in the coming months. For someone like me who is new to BBPress its quiet appealing.